An overview of the development. 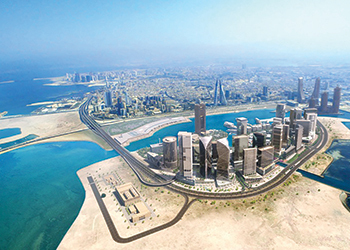 As it marks the 10th anniversary of its launch, Bahrain Bay is gearing up to attract further investors with many landmarks of the premier waterfront real estate development in Bahrain already completed and others due for completion this year. Distinctive buildings such as Four Seasons Hotel Bahrain Bay, Arcapita Bank’s global headquarters and the winding United Tower have made their mark on Bahrain’s skyline. Several new buildings are set to change the vista even further, with some beginning construction in 2016. Launched in 2006 on the northern coastline of Manama, the $2.5-billion mixed-use development has been designed to include residential, commercial, retail, tourism, and community facilities and public amenities. As a whole, the project is attracting a lot of interest from local and regional investors. In March last year, Canadian luxury hotel operator Four Seasons opened the Four Seasons Hotel Bahrain Bay. The spectacular 68-storey structure is built on its own exclusive island with breathtaking views and consists of 273 spacious hotel guest rooms including 57 suites. Bahrain Bay also welcomed a new investor – the Bin Faqeeh Real Estate Investment Company – which launched Bahrain Bay’s first residential complex called Water Bay. Water Bay will feature three distinct 10-storey residences with around 600 luxury apartments, a retail floor and a common basement car park extending below the buildings and also the roads between the parcels. Located on the north shore of the development, the apartments in Water Bay will have spectacular views onto the bay, including the Four Seasons resort, the new Avenues development and the Bahrain World Trade Centre. Al Baraka Bank’s Mideast headquarters at Bahrain Bay. The project is being developed on a fast-track basis, with preparatory ground works already under way. Basement construction will start by early 2016 and the first of the three 10-storey residential towers will be ready to welcome residents in early 2018. The development will be enhanced by a host of leisure facilities such as swimming pools, gymnasia, saunas as well as a wide range of supporting and restaurant outlets. The beginning of 2016 will see Al Baraka Banking Group, one of the world’s largest Islamic banking and financial services organisations, move into its building which will house the bank’s Middle East headquarters. The eye-catching United Tower by Cooperation Investment House, a Bahrain-based integrated real estate developer, is expected to open in mid-2016. The winding 47-storey tower will house Wyndham Grand Manama, an international five-star hotel by US-headquartered Wyndham Hotel Group. The hotel will occupy 14 floors of the spiralling landmark, along with office space to be leased in the open market. Adding to the hospitality offering at Bahrain Bay will be operated by Marriott, another international luxury hotel operator. A new design for the hotel is currently being finalised and construction is expected to start in mid-2016. AXA Group, a French multinational insurance firm and one of the world’s leading insurance and asset management groups, will be moving its regional office to Bahrain Bay in a newly constructed office building. Bay City, a development of almost 290,000 sq m of residential, commercial and retail space on the waterfront overlooking Manama, is also scheduled for construction in 2016. The development will be constructed in phases, with the first phase set to start in Q3 2016. Another residential project by Wafra is planned on the plot east of United Tower. The twin-towered project is currently in the early stages of design completion, leading to the start of construction in early 2016. Suri says Bahrain Bay’s infrastructure, which has been developed with sustainability in mind, is already in place and operational. “Our focus this year is concentrated on completing landscape works around prominent locations adding to the allure of the project for visitors and residents alike,” he adds. The CEO says the landmark waterfront community has remained stable through the economic challenges of the last decade, inspiring public confidence and bringing in a network of strong and trusted partners and investors. 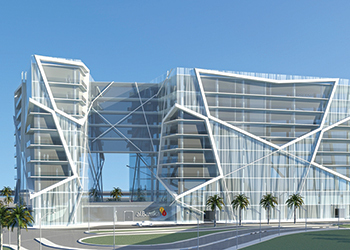 “Several of our existing partners have demonstrated enthusiasm in re-initiating real estate development opportunities that were previously put on hold and as a committed and reliable developer, our foremost objective is to support new concepts and ideas in realising a visionary concept created for a unique lifestyle that befits 21st century living,” Suri adds.